What is the goal of the Zinn Education Project? The goal of the Zinn Education Project is to introduce students to a more accurate, complex, and engaging understanding of United States history than is found in traditional textbooks and curricula. The empowering potential of studying U.S. history is often lost in a textbook-driven trivial pursuit of names and dates. People’s history materials and pedagogy emphasize the role of working people, women, people of color, and organized social movements in shaping history. Students learn that history is made not by a few heroic individuals, but instead by people’s choices and actions, thereby also learning that their own choices and actions matter. We believe that through taking a more engaging and more honest look at the past, we can help equip students with the analytical tools to make sense of — and improve — the world today. For a more complete description, read A People’s History, A People’s Pedagogy. Who uses the Zinn Education Project? Teachers and teacher educators in every state and territory in the U.S. download lessons from the Zinn Education Project website. “I always begin my U.S. history course with a lesson from the Zinn Education Project website called The People vs. Columbus, et al. It is amazing how engaged students become to not only learn the truth but also be able to defend themselves using the evidence provided. 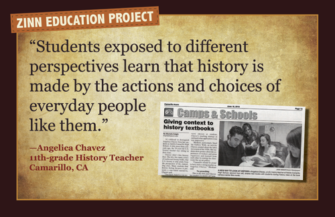 Students love creativity and this case allows students to come to their own conclusions.” —Miroslaba “Lili” Velo, U.S. and world history teacher, Tennyson High School, Hayward, Calif.
To date, 80,000 teachers have signed up to access the free people’s history lessons and nearly 10,000 more teachers sign up every year. The majority of educators who download the lessons are middle and high school social studies teachers in public, public charter, parochial, private, and home schools. In addition, there are teachers in other subject areas, librarians, administrators, and other school staff. Why is this project named after Howard Zinn? The Zinn Education Project was inspired by a scene from the documentary You Can’t Be Neutral on a Moving Train, in which Howard Zinn is speaking to high school students in Chicago about American history, and by a donor’s own experience of having Zinn as a professor. The donor wanted to honor Howard Zinn’s extraordinary contributions to the field of promoting “a people’s history,” and in particular his book A People’s History of the United States, which has sold more than 2 million copies and has been translated into many languages. Through this project we also seek to highlight the many resources on people’s history – including those published before and after A People’s History of the United States. How can I get in touch with other educators who are trying to teach from a social justice perspective? Where else can I find progressive classroom lessons and classroom book reviews? See more among the list of websites in the resource database on this site. What do you mean by downloadable “teaching activities”? A people’s history requires a people’s pedagogy to match. The teaching activities feature strategies that illustrate how a people’s history can be brought to life in the classroom. They are comprised of reflections on teaching about a people’s history, lessons, and critical reviews of literature. All of the suggested lessons have been used in classrooms and revised over time. Almost all of the lessons were first published by Rethinking Schools. How can I contribute teaching activities to this site? We can use support in numerous ways. Please see our Support page to find out how. How do I join your e-mail list? To receive our occasional e-newsletters, register for the Zinn Education Project website. You will be automatically added to our mailing list. Registration is free. Why should students study history? What do you see as some of the major problems in how US history has been taught in this country? How do you prevent history lessons from becoming a recitation of dates and battles and Congresspersons and presidents? How can teachers foster critical thinking so that students don’t merely memorize a new, albeit more progressive set of facts? Is it possible for history to be objective? My school district says I can’t use A People’s History of the United States because it it too biased and it is pushing a political agenda. How can I respond? No doubt, Zinn’s A People’s History has a perspective—and it is one that Zinn invites readers to think about in the very first chapter. That’s one of the reasons why we don’t consider Zinn’s book “biased,” because it is not hidden, unlike conventional textbooks produced by giant corporations, which never ask students to interrogate their perspective. Zinn’s book offers perspectives not included in student’s textbooks, perspectives from people who have been on the margins. The other thing that is true is that Zinn’s book has a lot more life than traditional textbooks, and so is likely to interest students who are often—rightly—turned off by the dull presentation of history in so many books. Does Zinn have an “agenda”? It depends on what is meant by agenda. As a World War II bombardier, Zinn was passionately antiwar, and that perspective is evident in everything he wrote. Having taught first at a college in the deep South during the Civil Rights Movement, Zinn was passionately against racism and in favor of people standing up for their rights. This too comes across in everything he wrote. And as someone who came of age intellectually during the 1930s, he was also profoundly concerned about workers’ rights. We don’t think of these as “agendas,” but as commitments to justice and humanity. Note that there was an attempt to ban any books by or about Zinn in Arkansas schools in 2017. Teachers across the state resisted and the legislation did not pass.